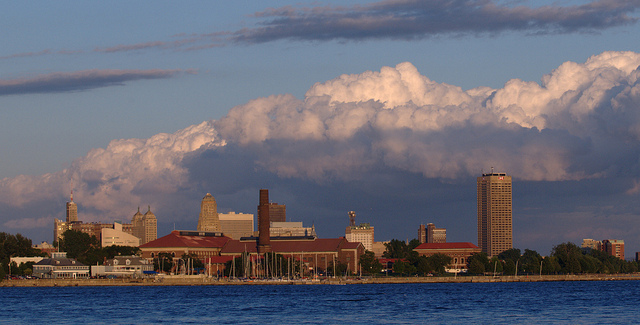 In 1950, Buffalo, New York stood as the nation's eighth largest city, with a population of 580,000. In 2011, the U.S. Census estimated a population of 261,000 - 50% white, 38% black, 10.5% Latino, and 3% Asian. Similar to other Rust Belt cities, like Cleveland, Detroit and Pittsburgh, Buffalo has experienced decline as manufacturing companies, steel industries, and blue-collar jobs have disappeared. However, to fill this gap, the City and its residents have initiated new approaches and ideas to tough problems, revitalizing their city from both the top-down and the bottom-up. 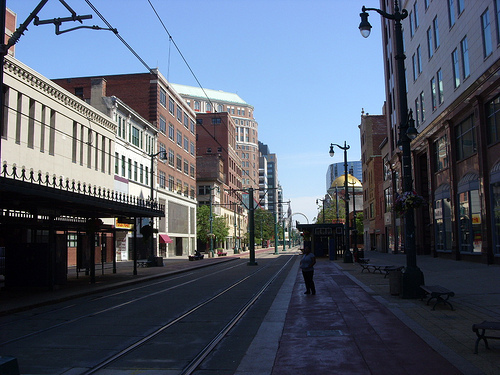 Many of these initiatives account for the fact that Buffalo is a weak market city and that returning to its peak population is not the primary goal. Instead the focus is on redefining the city by developing abandoned and vacant lots and by reinvigorating dilapidated neighborhoods and commercial areas. Buffalo's "Green Gold Strategy" aims to transform it from a declining Rust Belt city into an international center for businesses whose products and services solve environmental problems. Spearheaded by City Council President James W. Pitts, the Green Gold Development Corporation was established in 1999 to help initiate the strategy. One of GGDC's main goals is to redevelop the former Buffalo Forge plant into an Eco-Industrial Park, featuring an incubator for environmental technology companies. Community-initiated organizations, such as Buffalo Re-Use and Urban Roots Garden Cooperative, have taken a more bottom-up approach to improving the city of Buffalo. Buffalo Re-Use is tackling the city's issue with abandoned properties from a fresh perspective. Although its primary focus is to demolish buildings in a environmentally friendly way, reducing the amount of waste by recycling materials, Buffalo Re-Use has engaged block clubs and community associations in dialogue about how to use the vacant land for productive uses, like urban agricultural and green spaces. Another organization, the Urban Roots Garden Cooperative, was founded by concerned city residents, who wanted to spend their money locally within the city, develop community gardens and a source of local produce, and work to beautify the city. Now boasting more than 400 member owners, Urban Roots Garden Cooperative works with the neighborhood to encourage urban renewal and serve as a model for other communities and cities. People United for Sustainable Housing (PUSH Buffalo), first founded in 2005, is a membership-based community organization dedicated to affordable housing, equitable jobs and ecological sustainability for the West Side of Buffalo.